Forced air gas furnaces are the most common and popular home heating solutions in Canada. For homeowners in Ontario, installing a new furnace or replacing an existing furnace with a newer model, the experienced professionals at Air Leaders Inc. will make the furnace installation process fast, safe, and affordable. Furnaces heat your home by circulating hot air through heating ducts leading to every room. Air is heated in the furnace by natural gas or an electric heater, and are blown through the ducts via the furnace blower. When should you install a new furnace? 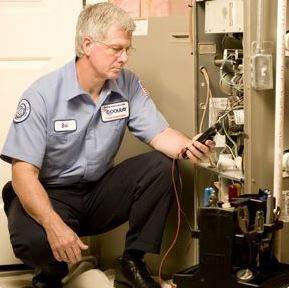 The best time to install a new furnace is before you need to. The life expectancy of a gas furnace is between 12 to 15 years, if maintained annually. However, many people replace theirs earlier to save money on operation costs, and to enjoy the extra comfort and safety a new furnace brings. Replacing an old or damaged furnace in the warmer months means that you will not have to endure the colder months without heat. Furnace failures usually occur when they overwork, which is typically during cold winter nights. Not only would this be uncomfortable, but it can lead to further damage to your home as a result of frozen pipes and other cold-weather related issues. If you are unsure, you can always consult with one of our licensed technicians for a complete check up of your existing furnace & we can evaluate the condition of your furnace. New furnaces offered by Air Leaders Inc. are highly efficient, not only on gas, but also electricity. High-efficiency furnaces with variable-speed ECM motors use less energy than a 100-watt light bulb. Older furnaces with standard blower motors, on average, consume nearly 500 watts. These furnaces most often qualify for a rebate from governmental energy grants and programs. For more information, ask our experts at Air Leaders Inc. to find out if you are an eligible candidate . In addition to saving operating costs, many new furnaces recommended by Air Leaders Inc. allow the heating system to run longer, providing a level of comfort unsurpassed compared to conventional furnaces. Occupants will find a more even, consistent temperature throughout the house. Plus, indoor air quality is enhanced by extending the operation time of humidification and air-filtration accessories. For your peace of mind, new high-efficiency furnaces are equipped with a long list of safety features. For example, specially designed sensors shut off the unit if the burner fails to ignite properly, a flue blockage occurs or operating temperatures exceed the norm. High-efficiency furnaces sold and installed by professionals at Air Leaders Inc. are hand picked for your home and come with quality materials ensuring that the entire system is built to last. Our new furnaces’ heat exchangers are made without welds to resist the corrosion and cracks over time, and are covered by a lifetime warranty from manufacturers. On top of all features discussed above, new furnaces are equipped with variable speed. ECM motors, if sized and set up properly can run significantly quieter than an older furnace. So, If you hear your furnace every time it turns on, please discuss that concern with your professional at Air Leaders Inc. during your first free consultation visit. Modern furnaces are high tech pieces of equipment. They are responsive, efficient, and effective home heating devices. Most consist of a heat exchanger, a secondary heat exchanger, Inducer Blower, Hot Surface Ignitor (No pilot), Electronic Board, gas valve, and an external thermostat. Homeowners usually only deal with the thermostat, but there is a lot at work happening behind the scenes every time you raise or lower the temperature in your home! The first step of installing a furnace is to remove the existing unit and prep the area where the new furnace will be installed. Then, the new unit needs to be brought to the installation site, unpacked and prepped for installation. At this stage, we will inspect your air-conditioner evaporator coil and to conduct a thorough cleaning, if needed. Finally, the gas, electrical, venting and air ducts are attached. It is always highly recommended to replace your furnace, air-conditioner and thermostat at the same time to achieve optimum efficiency, reliability and durability between all systems.